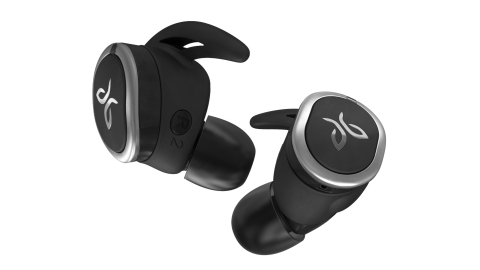 SALT LAKE CITY & LAUSANNE, Switzerland--(BUSINESS WIRE)--Sport headphone pioneer Jaybird announced today the Jaybird RUN True Wireless Sport Headphones, offering a radically freeing experience to runners. Designed from insights gained from top runners around the world, Jaybird RUN delivers a secure, run-specific comfort-fit, sweat proofing, water resistance and skip-free customizable sound. All this performance is packed in a beautifully designed, wire-free, lightweight and compact form factor that provides 12 hours of portable battery life with the included charging case. Jaybird RUN features the latest in true wireless Bluetooth® technology, offering big, rich sound with drop-free connectivity in a stylish, low-profile design. Jaybird RUN comes with a selection of interchangeable tips and fins for different ear sizes, so you're sure to get the perfect secure and comfortable fit. And its double hydrophobic nano coating protects your headphones from sweat and water damage. One intuitive control-button takes calls, starts and stops music, skips tracks and activates Siri or Google Assistant. It's even designed for one-ear use, so runners can listen while staying aware of their surroundings. "Music fuels my run," said Timothy Olson, Jaybird athlete and two-time winner and record holder of the Western States 100 Mile race. "I have my race playlists and they power me on the trail. In the past, cords have always gotten in my way or snagged on bushes and trees. Jaybird RUN headphones are the perfect way to bring music with me. It's amazing to run with complete freedom and no wires, and the fit is so comfortable and secure that I never worry about losing them." With Jaybird RUN, you can have your music your way. Customize the sound signature with the free Jaybird App by adjusting the lows, mids and highs for a truly personalized music experience. The Jaybird App can also help you locate your headphones with the Find My Buds feature, in case they go missing. The app even allows you to share Spotify running-themed playlists with the Jaybird community. Jaybird RUN headphones come in two colors: Drift (white with silver metal accents) and Jet (black with silver metal accents). Both deliver four hours of music on a single charge, and the pocket-sized charging case provides an additional eight hours, for a total of 12 hours of portable battery life. A quick, five-minute charge gives you one hour of play time, so you never have to hit the trail or pavement without your music. Also today, Jaybird announced a redesign of its award-winning, ultra-small Freedom headphones for greater comfort and an improved fit. FREEDOM 2 with SpeedFit the same incredible, customizable sound you've come to expect from Jaybird, but with an even better fit thanks to softer and more flexible combined tips and fins and SpeedFit, an integrated cord management system. Responding to input from our athletes and fans, it's now easier than ever to switch from the under- to over-ear configuration, lifting the cord off the back of your neck to deliver a secure fit with complete freedom. The combined tips and fins also make it quicker to get a customized fit. With the smallest form factor on the market, FREEDOM 2 is perfect for those with smaller ears or anyone looking for low profile, lightweight, sweat-proof and water resistant headphones with up to eight hours of on-the-go playtime. Jaybird RUN True Wireless Sport Headphones and Jaybird FREEDOM 2 Wireless Sport Headphones are expected to be available in stores in October and can be pre-ordered beginning today from select retailers including jaybirdsport.com, bestbuy.com, and amazon.com. The suggested retail price of RUN is $179.99 and Freedom 2 is $149.99. For more information, please visit jaybirdsport.com or connect with us on Facebook and Instagram. The Jaybird app is free and available through the iOS® and Android™ app stores. Established in 2006, Jaybird is a pioneer of sports Bluetooth® headphones for runners, outdoor athletes, and fitness enthusiasts. By working closely with their team of professional athletes, Jaybird has established itself as the headphone brand for active people who love to power their passion with wireless music. With ultra-small wireless headphones, a secure comfort-fit, sweat-proofing and water-resistance, and incredible, customizable sound, Jaybird continues to evolve and define what it means to motivate people to get outdoors and push themselves with music. Jaybird announces the Jaybird RUN True Wireless Sport Headphones, the first true wireless headphone for running and sport.